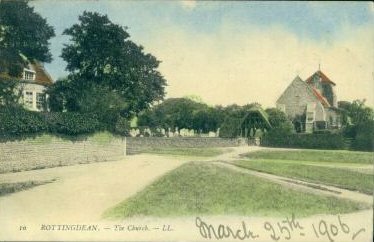 The Windmill. 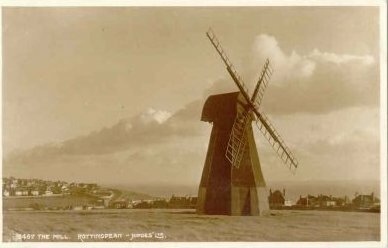 Situated on Beacon Hill, high above the village of Rottingdean stands the old smock mill. 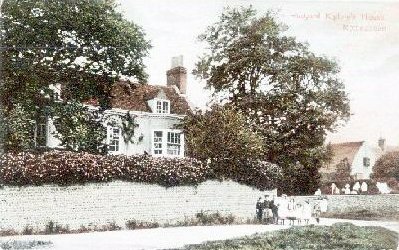 The mill has been here since 1802 and has been a prominent landmark to sailors and travellers alike since then. 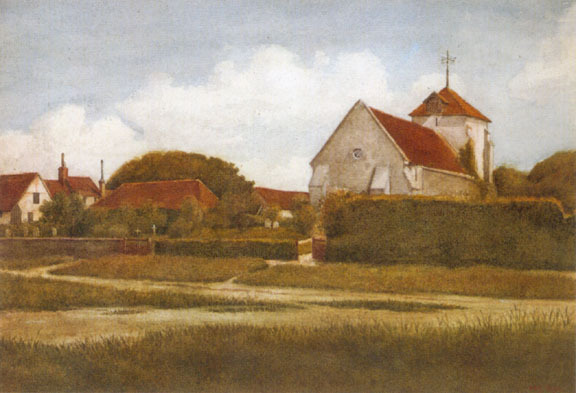 A drawing of this mill by Sir William Nicholson has since become famous as the colophon used by Heinemann, the publishers. 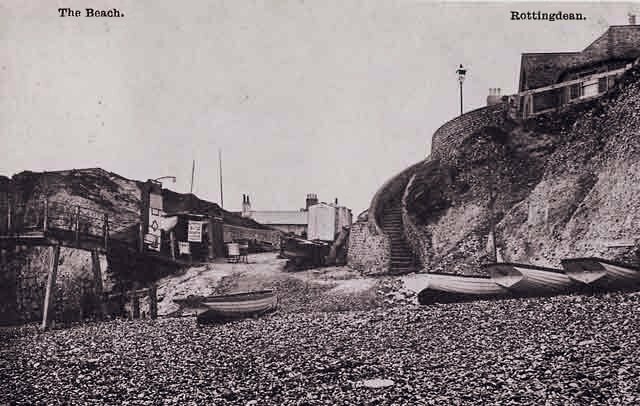 A village nestling in a downland valley: Dating from 1831 this print shows the cliffs and beach at Rottingdean before much of this was swept away by the sea. 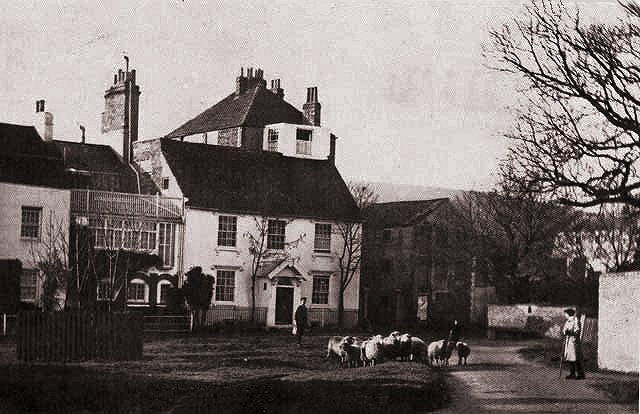 Notice the windmill on the hill and the Old King of Prussia Inn that is now known as the White Horse hotel. 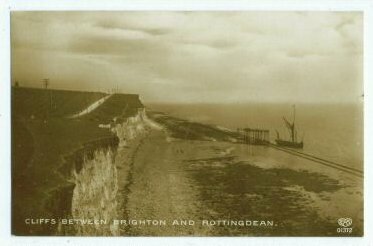 Ovingdean Gap -half way between Black Rock and Rottingdean. 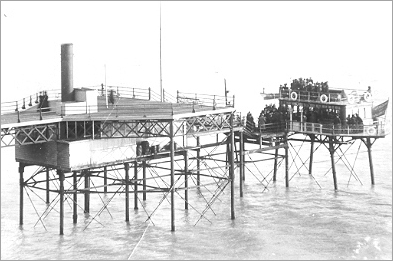 A pier and landing stage is in the process of being built for Volk's railway. 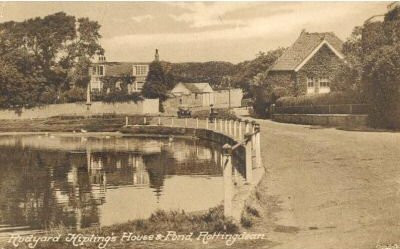 Note the old barge in the process of depositing building materials. 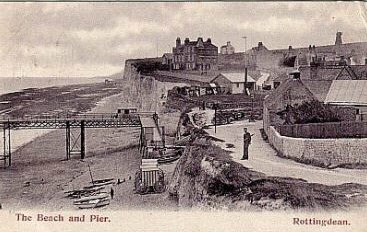 The pier at Rottingdean was built as the eastern end of Volk's Electric Railway between 1894 and 1896. 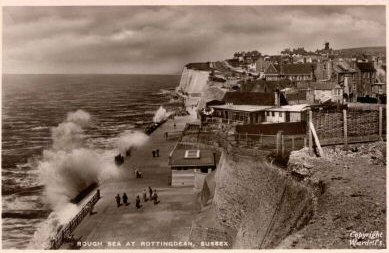 Between Black Rock and Rottingdean the sea thunders against the chalk cliffs so Volk's solution was to build a sea going railway. 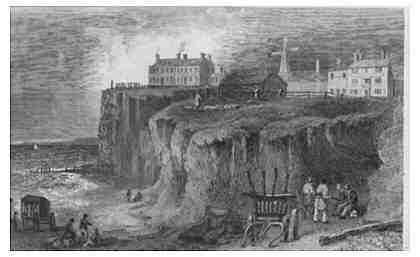 The Railway ran at the foot of the high cliffs and was 2.75 miles long. 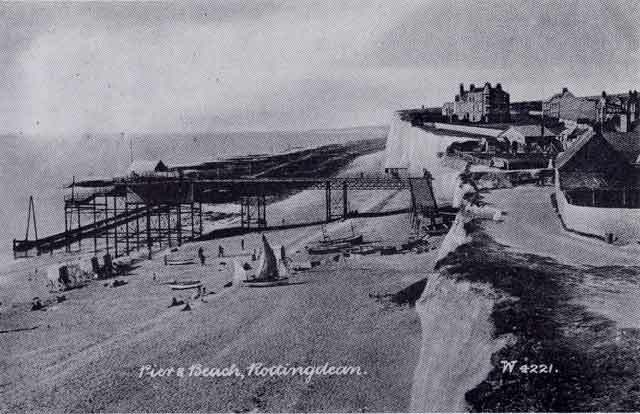 This photograph was probably taken in early 1896 when the pier was still under construction. 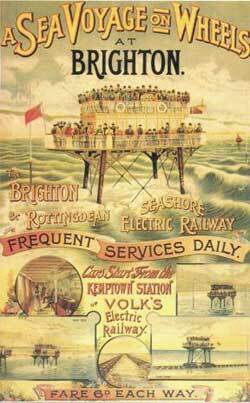 The railway opened on 28th November 1896 to a great fanfare. 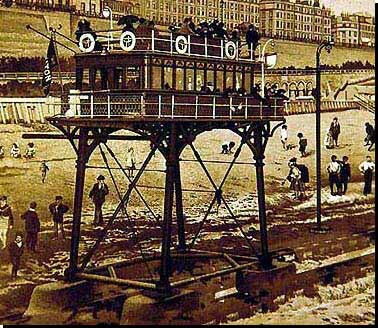 Less than a week later, on the night of the 4th and 5th of December a great storm destroyed Brighton's old Chain Pier, badly damaged the original electric railway and all but destroyed the project. 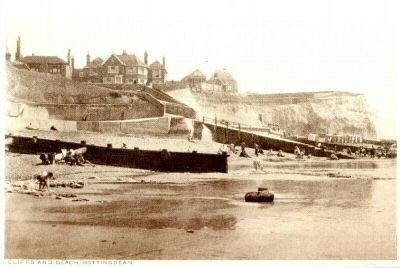 Pioneer had broken from her moorings at Rottingdean and was exposed to the full force of the storm. By morning she lay on her side broken almost beyond repair. 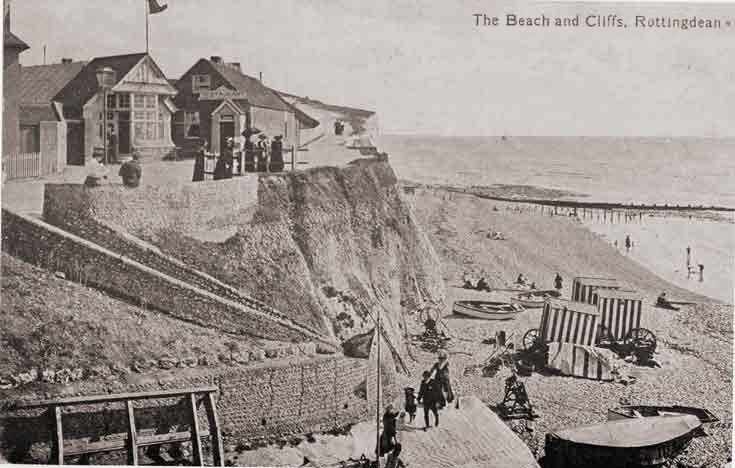 The damage was repaired and the railway reopened in July 1897 and continued until January 1901, despite frequent storm damage and shifting shingle often covering portions of the track. 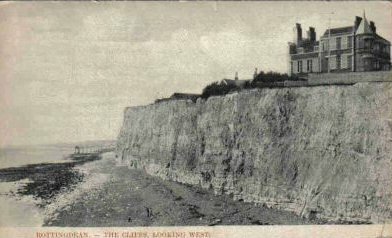 The building of sea defences near Black Rock in 1901 forced the closure of the sea going railway. 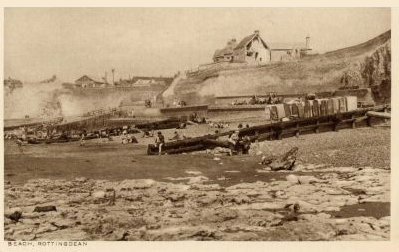 No longer required Pioneer was lashed to the pier at Ovingdean and remained in situ gently rusting away until 1910 when the remnants of the railway were sold for scrap. 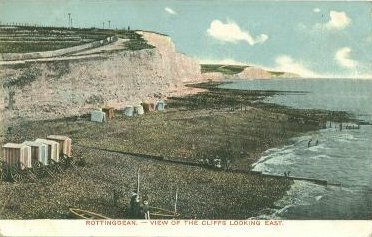 The only traces that remain of the railway are carved ruts in the chalk, a series of concrete blocks and the stumps of wooden posts that become exposed at low tide. A picture of Pioneer running through the sea. 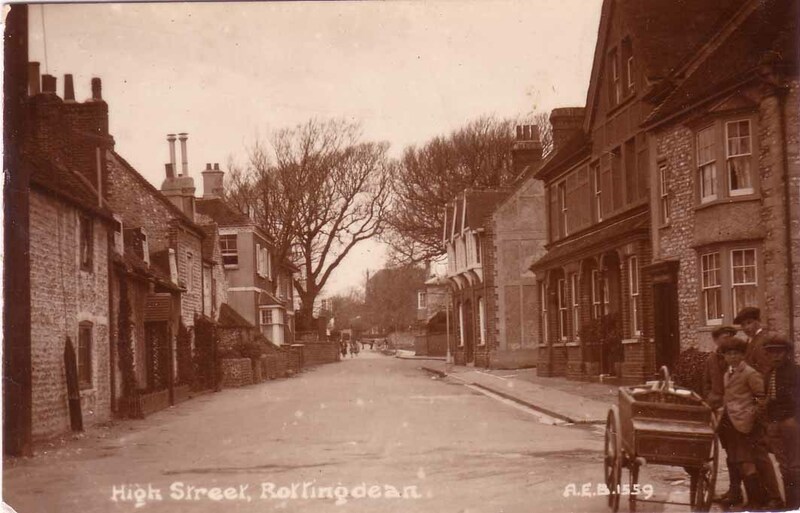 : Notice the wooden poles that carried the power cable. 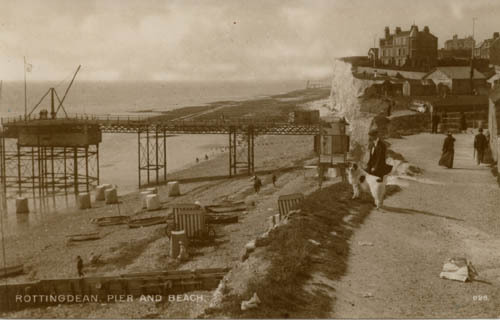 Another view of the pier taken around the same time as the previous picture (1896). 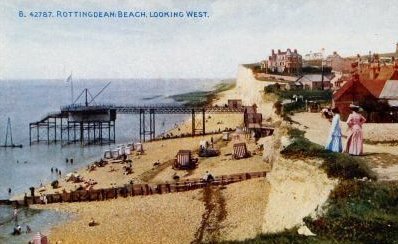 The tide has gone out further and you can see the rails. 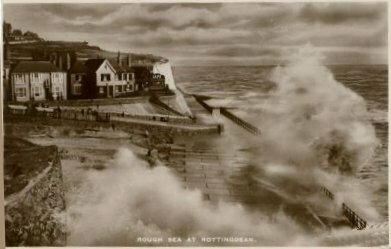 The sea has now encroached further and this picture taken early 1900 shows just how much has been swept away. 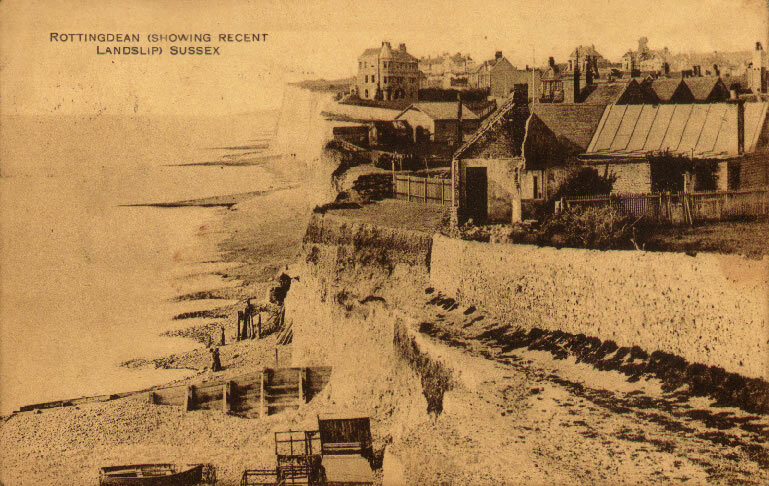 Some of the builings in the earlier print are now balanced precariously on the cliff edge. 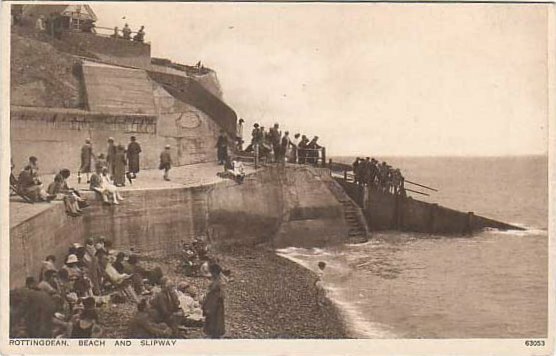 A similar picture: Probably taken a year later because you can see guard rails behin the people sitting on the wall. The Geisha Tea Rooms are flying a flag marked "Geisha". Pioneer, otherwise known as Daddy Longlegs, in action: Note the power transmission cables stuck up on poles and the attachment from the vehicle. A close up look at "Pioneer"- the railway carriage. 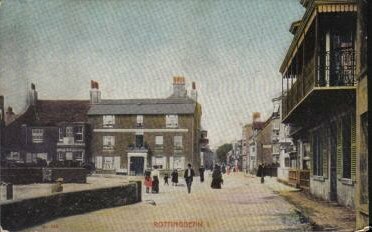 Rottingdean Pier head: . "Pioneer" has just docked at the pier head and passengers are getting on. 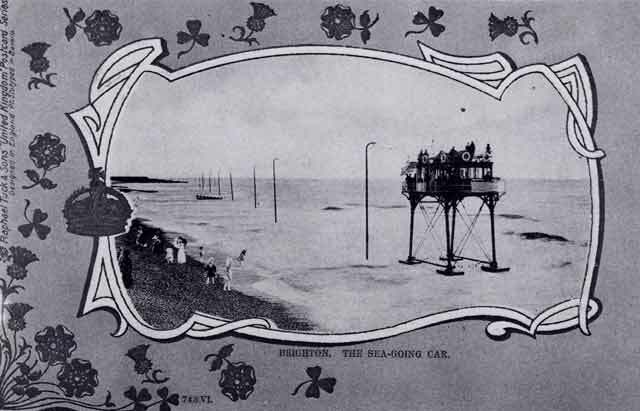 The electrical power unit is slung underneath the pier. 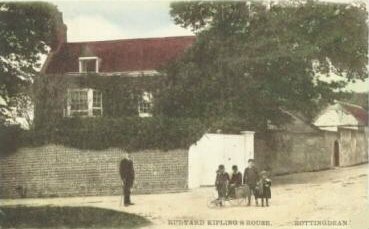 The pier head was a favourite place for Rudyard Kipling and children who used to fish at the end of the pier. . 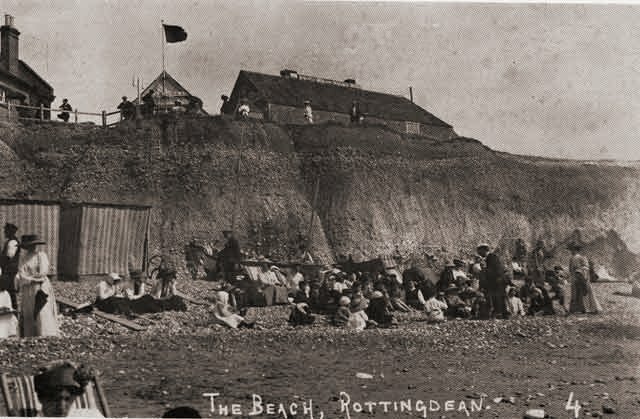 The beach by the Gap- Taken about the same time as the picture above. 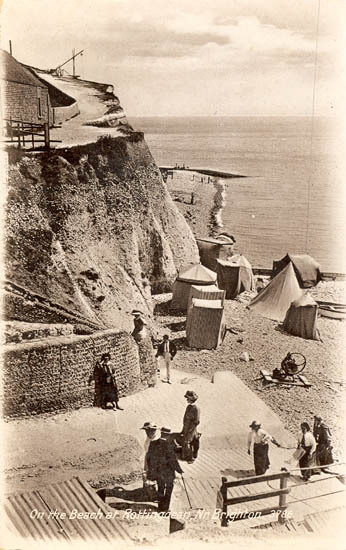 The beach by the Gap- Not a bikini in sight! 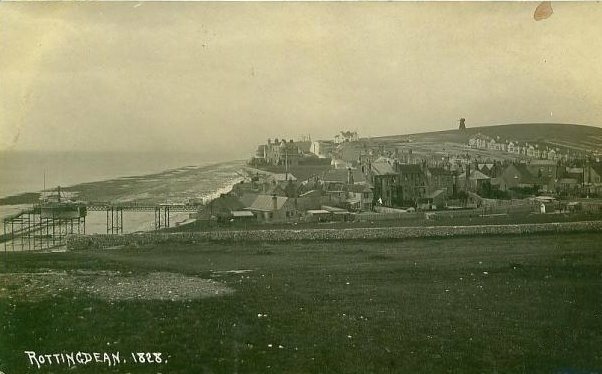 The Seafront- Taken c 1908. 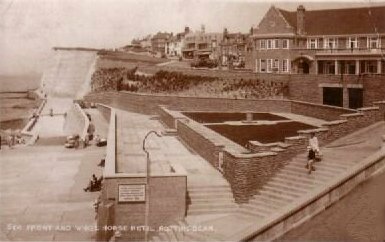 The Seafront again- Now turned into a concrete jungle. . 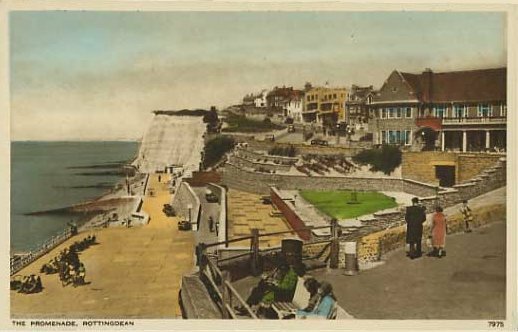 The Seafront again- Taken in 1936 . . 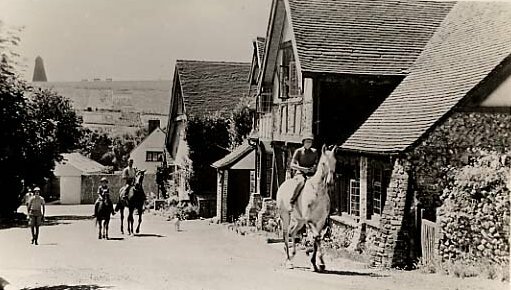 The White Horse Hotel - taken around 1952. 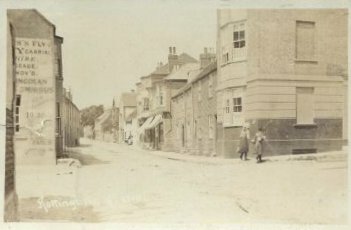 White Horse Hotel - Photograph taken around 1920 . 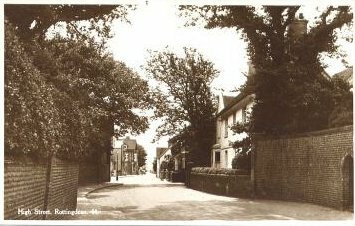 St. Margarets- Photograph taken around 1950 . 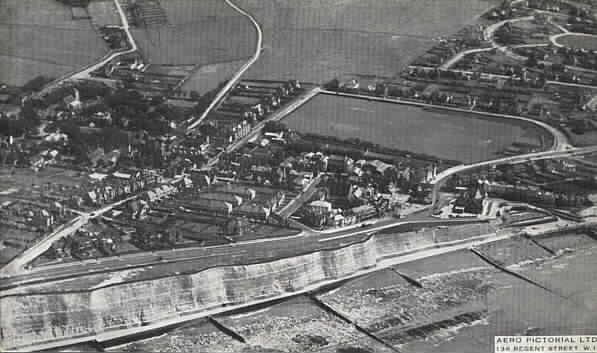 The flats were built in the late 1930's despite a lot of local opposition to them at the time. 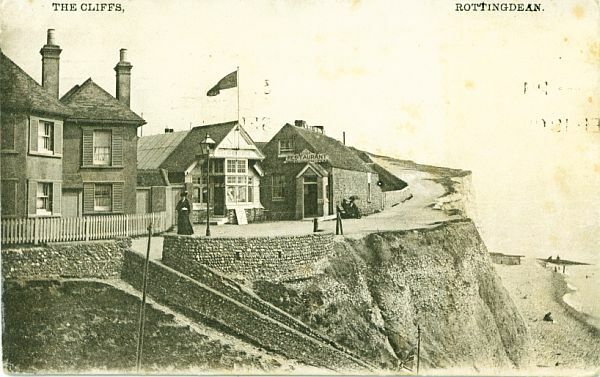 The Local Ratepayers Association when voicing their opposition to them said that "it views this monstrous structure with horror and dismay; feelings shared by practically every inhabitant of Rottingdean" . Views probably still shared to this day. 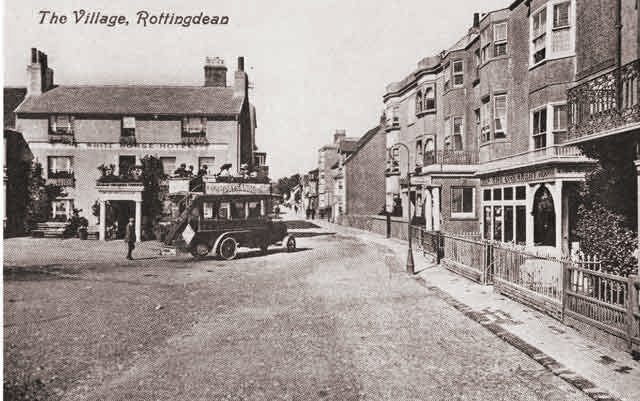 Royal Oak Hotel- The horse drawn carriage is on the coast road and stands by the junction with the High Street. 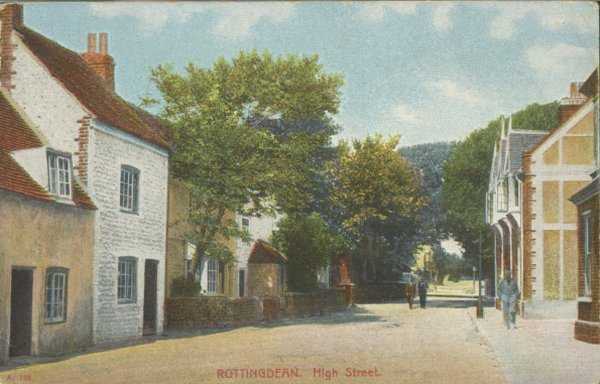 Virtually everything has been demolished now. 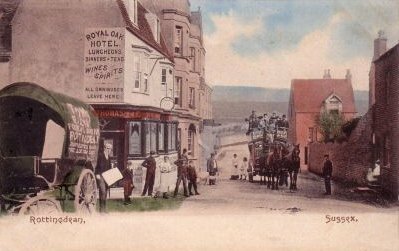 The Royal Oak, and the former Victoria Inn behind, for example, used to be where the West Street car park is today. 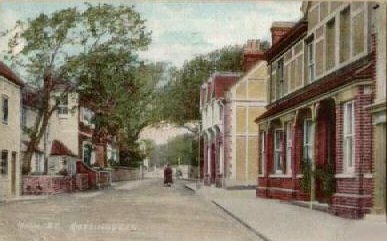 The High Street- Looking north. 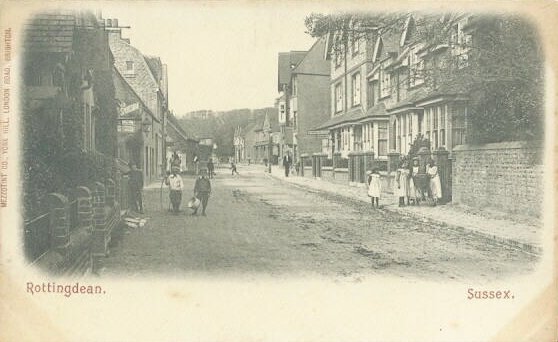 The High Street- Another picture looking north- around 1910. 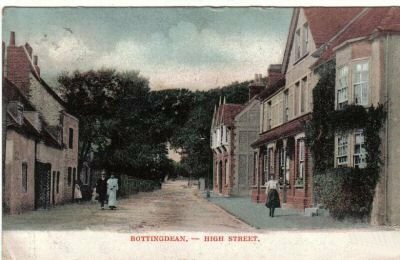 The High Street- Looking north c 1906. 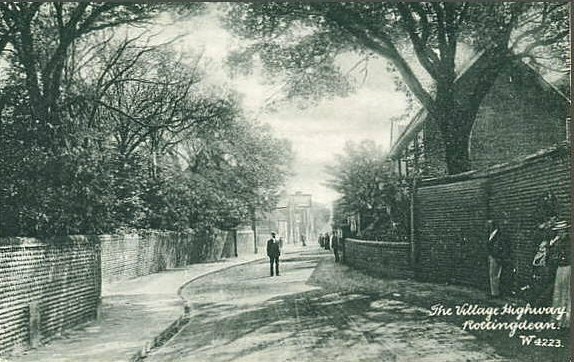 The High Street- Looking north, a little further up the village. 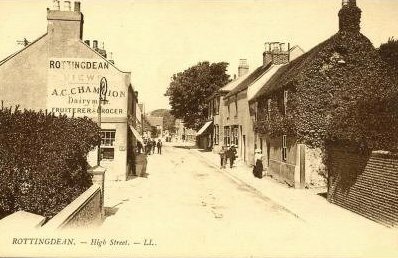 The High Street- Looking south. 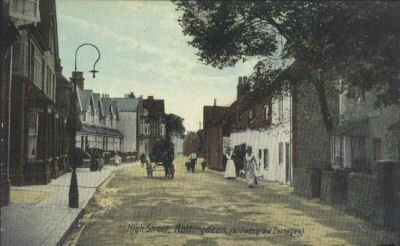 The High Street- The wall of Rudyard Kipling's House is to be seen towards the left of the picture..
Another view of Burne Jones's house- The scene of sheep and shepherd was soon to disappear. 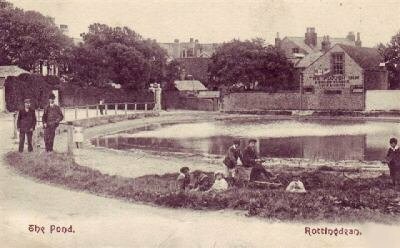 The Pond- Taken in 1905 the picture shows the pond and the Plough Inn in the background. Very little has changed since then.. 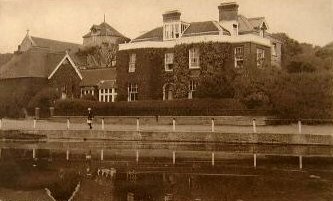 The same pond- taken in the 1950's, viewed from the south and looking upon The Elms. 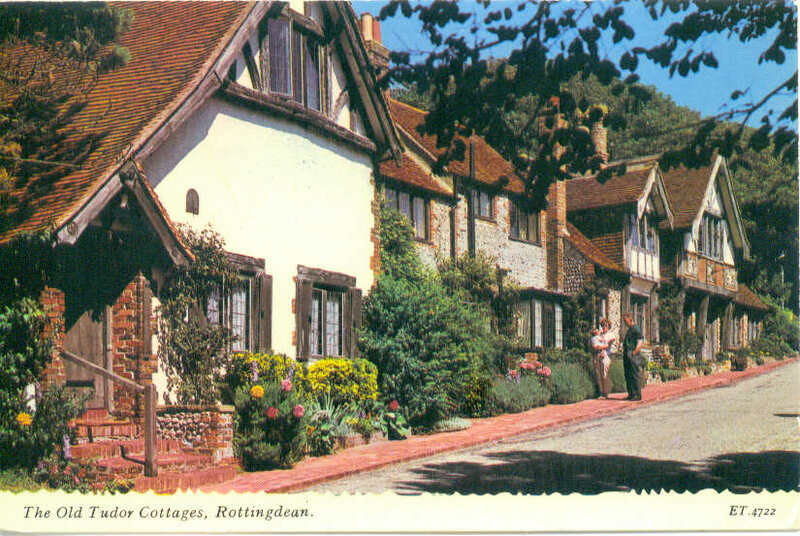 Tudor Cottages again- Note the windmil in the far distance without the usual sail arms. 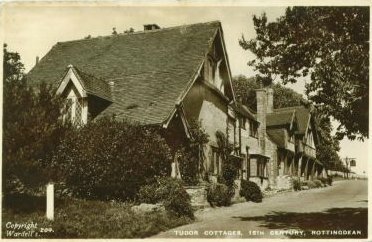 Tudor Close Hotel- These apparently looking Tudor buildings were originally two old barns and the cowsheds of old Court Farm. 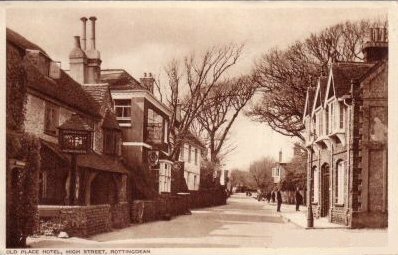 They were some 100 feet in length and were substantially rebuilt in 1929 to look like seven adjoining dwellings of the Tudor period. 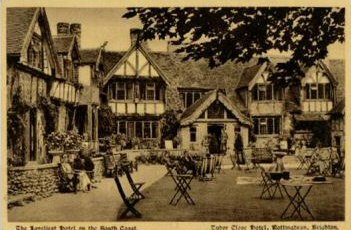 They proved difficult to sell 1929 and the houses were quickly remodeled to form the Tudor Close Hotel that you see here. 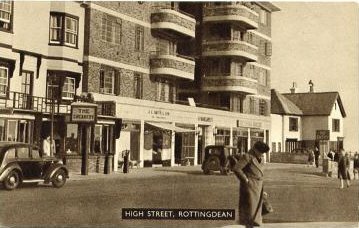 The hotel proved to be a fashionable halt for visitors to Rottingdean in the 1930's. 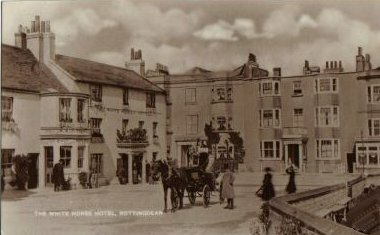 After the second world war the Hotel lost much of its custom and the building was altered yet again to form the seven adjoining houses that now occupies the site..
Dene Court Road- Taken c 1925 . 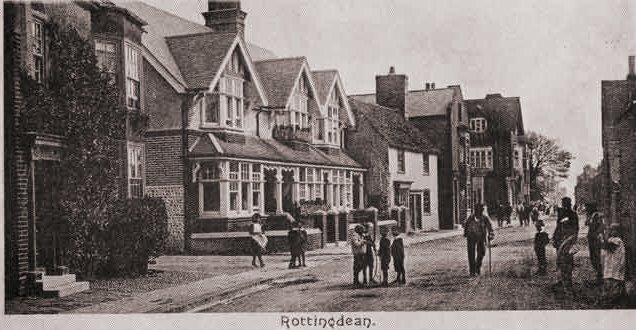 Rottingdean School - The School is situated to the north of the village and was built in 1894. 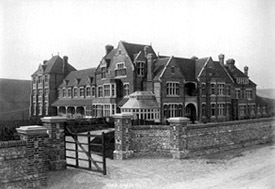 When this picture was taken in 1896 the School had only recently opened. 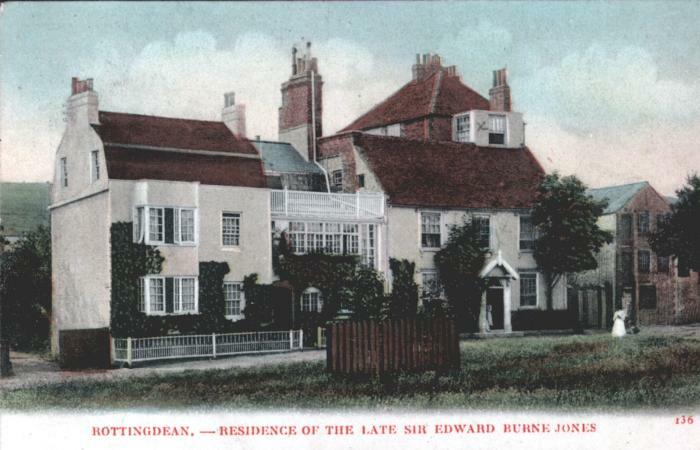 It was to remain until 1962 when it was demolished after a major fire. 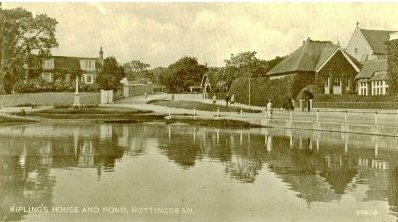 Shortly afterwards the site was cleared to make way for a Trade Union rest centre and some domestic housing(The Rotyngs) . 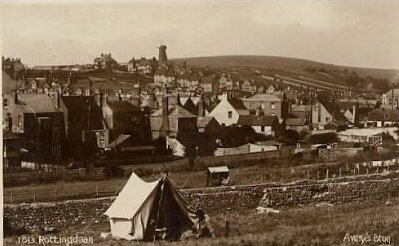 Even the Trade Union centre has been demolished now and all that remains are tightly packed housing at the end of the village. 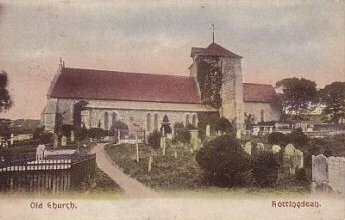 St Margaret's Church - . 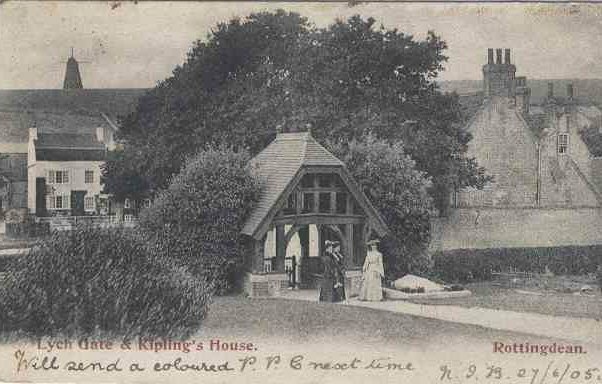 The Lychgate of St Margaret's Church- The Lych Gate was built in 1897 to serve as the grand entrance to St Margaret's Churchyard. 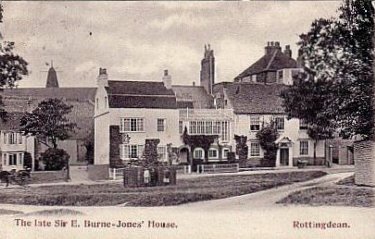 This postcard dates from 1905 and on the right you can see Rudyard Kipling's old house, The Elms, whilst to the left is Burne Jones's property, The Elms. 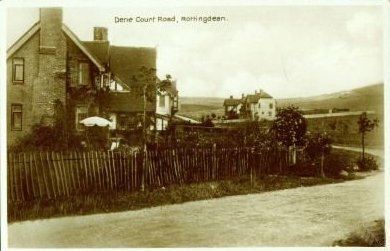 On the downs beyond is the old windmill . 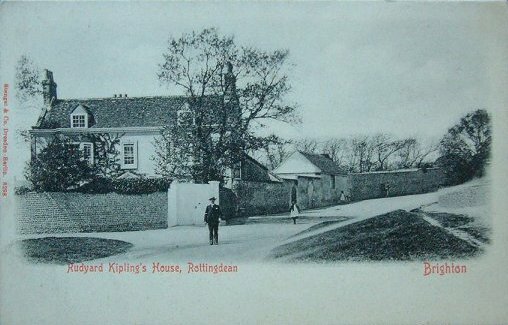 The Elms- Rudyard Kipling's House. 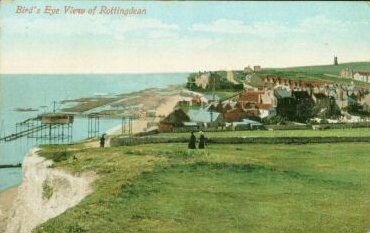 A composite picture of Rottingdean- Looking Westwards. 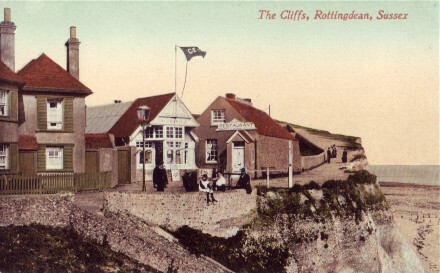 Rottingdean in 1920: No undercliff walk. 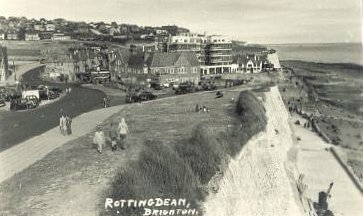 No Saltdean! 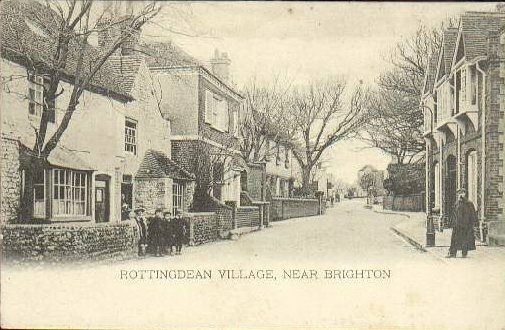 A map showing the old field system for East Rottingdean and Saltdean is displayed below which you can compare with the 1920's photo. 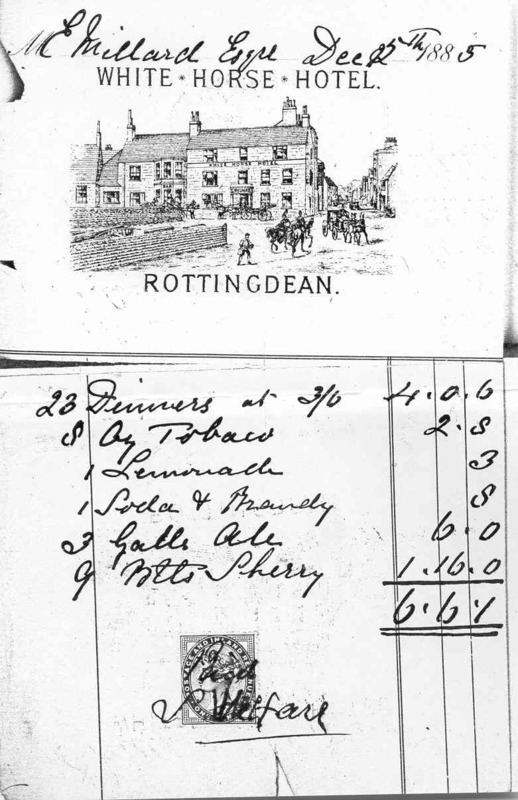 Click on the map to expand the image. 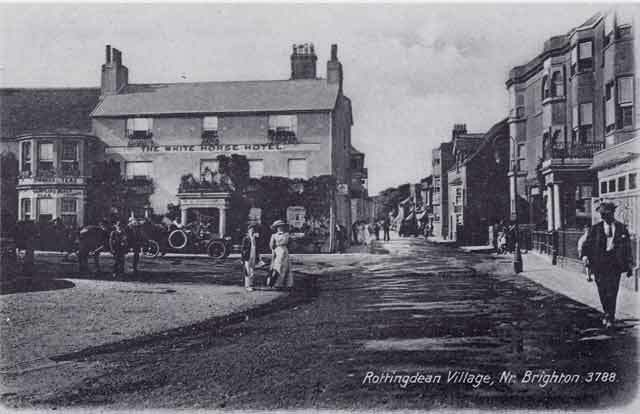 1899 Map of Rottingdean- Click on the map to expand image. 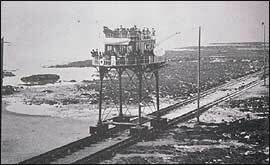 The Electric Railway has now been built. 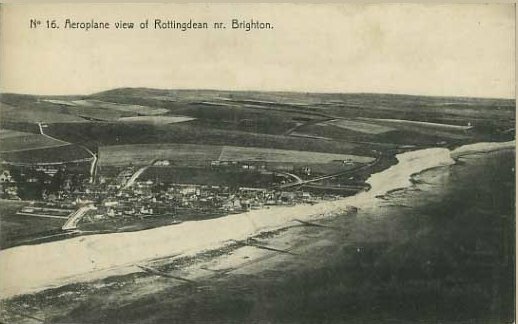 1931 Map of Rottingdean- Click on map to expand. 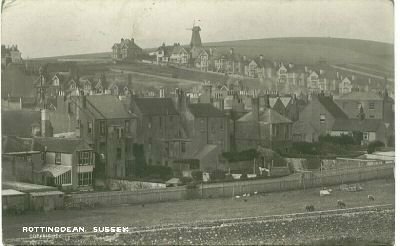 Notice that the roads of Saltdean have been laid out and houses are beginning to appear.